Living in a one room house has some extra challenges. Like when it’s time to repaint. There is no second room to live in while the job is getting done. The bed is the couch, the dining room table is the writing desk. How do I leave room for movement…how do I preserve some sense of visual silence amid the chaos? These pesky questions have been putting off painting for at least two years because I couldn’t figure out the logistics, but now, I am finally disgusted with the dingy ceiling and pock marked walls. It’s time. This weekend, I began by packing my extra things in boxes. The man who lived in this house before me used to move everything out into the yard each summer and then carefully re-evaluate what he put back. Clearly, he did not have as many things as I do. 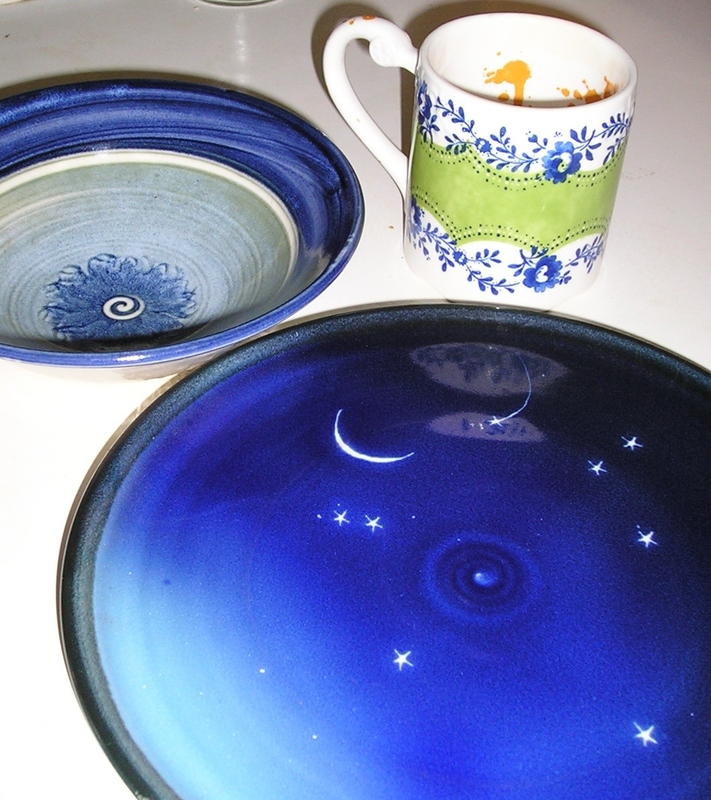 I started with the kitchen, leaving out one set of dishes for myself and two extra plates and bowls in the picnic basket. Pots and pans went in the oven. 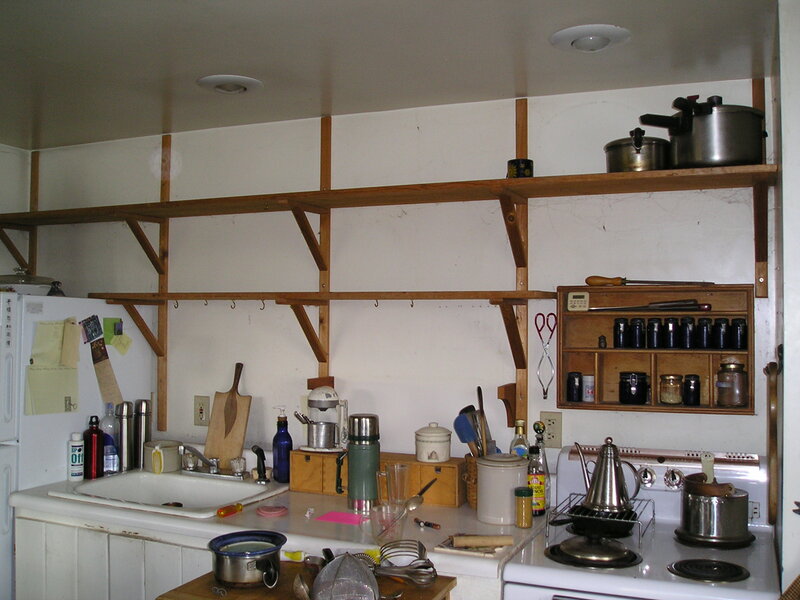 My plan is to remove the open shelving and add some cabinets, so everything has to be taken down. 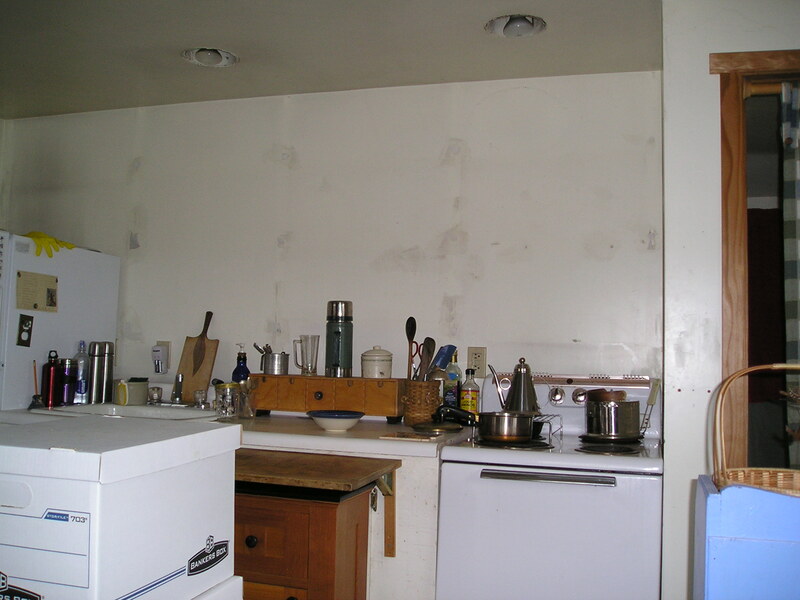 As I worked, I got clearer about the order of painting: ceiling and kitchen wall first, then the north wall. I also began to feel a wonderful sense of calm. Sarah Ban Breathnach talks about the “fullness of nothing”…about possibility that’s available in emptiness. Zen might call it beginner’s mind. Odd as it sounds, I like having my stuff in boxes for awhile. It takes me back to the list and to simplicity and, now that I have begun, I am tempted to prolong the period beyond painting completion. I imagine opening the boxes to be like Christmas, complete with a few surprises. I may even discover items I can live without. The cats were curious and nervous. As each new box added to the pile, they climbed on top and had a look around. Then they settled into watching me pack from their new vantage point. I have in mind a series of open and closed cabinets, both painted and natural wood, each with a different style and shape. I call it vintage eclectic. 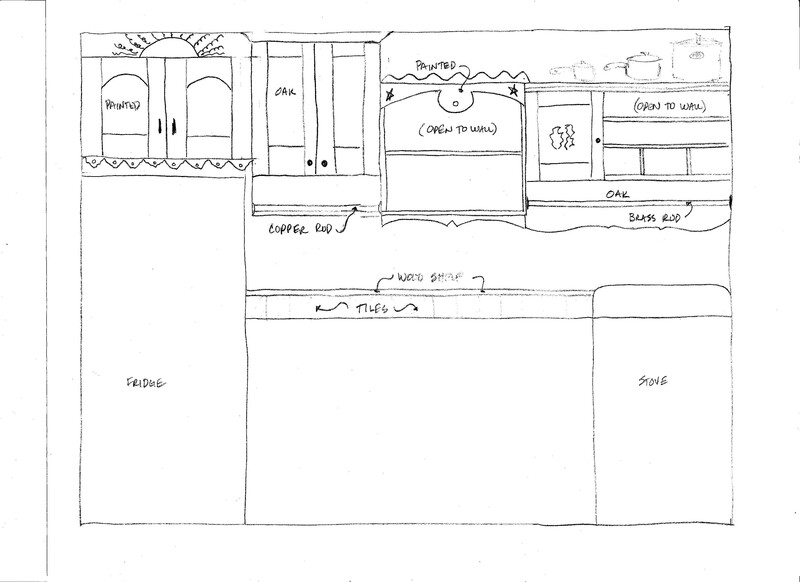 My goal is to retain easy access to dishes (open), more storage for food (closed), and a quirky, colorful wall. In the barn, I found an old oak cabinet which is open on one side and closed on the other. On the cabinet door is an inlaid picture of a boy and a girl, and it deserves a new life. I’m hoping to get permission to use it. Once I completed packing, it was demolition time. Down with the shelves and brackets. Down with hooks and nails and screws. Down with refrigerator magnets, photos, cartoons and poems. Then I started scrubbing with TSP. I set my carrot, designing the new wall, clearly in my mind as I craned my neck to the ceiling and washed greasy smudges from the walls. Lastly, I spackled the holes. Ahhhhhh. Now for the fun part. Now the hunt begins…gathering the available resources like the oak cabinet in the barn and the oak cabinet doors that I bought quite awhile ago…and keeping my eye out for cast offs that can be reworked. Oh yeah…and finish the rest of the cleaning and then paint. Good luck! I have started stripping wallpaper and painting my foyer, two story stairs (scary!) and hallway. Mine is being done in sections as we wanted new carpet (and were under a deadline for my daughter’s wedding). I have lost some motivation but the idea of completion (the vision of new and pretty) keeps me moving. The prep work is the most time consuming and least fun, isn’t it? Can’t wait to see your completed work! Please post pics! Thanks for sharing, Denise. I’m definitely dragging my feet on the prep work now that I did the fun, design part. Sigh. By the way, how’s that tiara coming along? I was making my daughter’s wedding veil. Cutting the material etc was easy (thank you youtube). But I tried sewing beads on the veil material. Not easy! I was not happy with the results (I’m somewhat of a perfectionist). I convinced her to get a beautiful (yet expensive) one at the bridal shop. The wedding was two weeks ago. She was stunning (with or without the veil). I feel a little bit lost now that it’s over, so onto another project! Not sure how painting red is now (they have primer and paint in one) but it is a tricky color. I painted a room about 5 years ago in burgundy and had to use a separate Bozooka bubble gum colored primer. Ok, my motivation right now to get this foyer painting finished is sewing curtains for my sun room. Here I go…Keep us posted on your progress! Thanks for inspiring me with your do-over projects and bold colors! I’m hungering to finish the north wall: deep red!! As I contemplate cleaning the ceiling, I think of Michelangelo painting the Cistene Chapel…I only have 350 sq ft!!! Your slow and deliberate decision making guarantees that you will cherish the results. “Contentment” is so under-rated. Simplicity is awesome. Thanks for reminding me, Carol. Contentment is definitely one of my values and a place of grace that I get to visit quite often. Lucky me. And now that the walls are empty, I am enjoying the emptiness.